The curative management of renal cell carcinoma (RCC) remains surgical (see the image below). Recent advances in preoperative staging, specifically modern imaging techniques, and improvements in surgical techniques have made nephron-sparing surgery (NSS) an attractive alternative to radical nephrectomy in select patients. 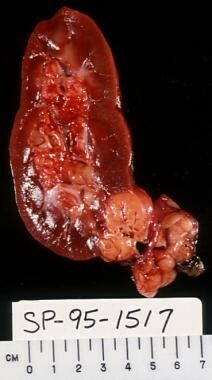 Cut section of nephrectomy specimen demonstrating renal cell carcinoma (RCC), with an adjacent simple cyst. Over the past decade, an increasing body of literature regarding not only the indications but also the safety and efficacy of NSS for RCC has developed. Today, NSS is an established approach for patients with localized RCC when preservation of renal function is desired. The clinical utility of NSS is revealed when several factors are considered. First, RCC usually does not become symptomatic until late in its course. Lesions detected incidentally tend to be smaller and of lesser grade and, thus, more amenable to conservative surgery. Next, differential diagnoses of incidentally detected solid renal masses include oncocytoma, angiomyolipoma, transitional cell carcinoma, complex cyst, or a hypertrophied column of Bertin. The characteristics of most of these entities on the imaging studies, most commonly CT scanning, and their clinical presentation allow for their differentiation. However, consider solid lesions that radiographically enhance with intravenous contrast to be RCC until proven otherwise. Of these lesions, 10-15% are oncocytomas. Needle biopsies have not been shown to be reliable and are associated with high false-negative rates. Therefore, although an operative approach is indicated, NSS allows for equivalent cancer treatment while minimizing the risk of nephron loss in the 10% of patients with a benign lesion. Finally, the natural history and malignant potential of small RCC is not well understood. Although observation could be a viable option in elderly patients with high comorbidities, NSS allows for curative surgery and elimination of uncertainty in the average patient with acceptable expected longevity. The goals of conservative resection of RCC are complete local surgical removal of the malignancy and preservation of adequate renal function. This is a delicate balance, which makes renal-preserving surgery, at times, both challenging and controversial. In addition to RCC, partial nephrectomy is an important alternative to radical nephrectomy for certain benign conditions that affect the kidney. It allows for optimal surgical treatment and, at the same time, obviates overtreatment and nephron loss when possible and necessary. For patient education resources, see the Cancer Center and Renal Cell Cancer. Synchronous bilateral tumors, tumors in a solitary kidney, and the presence of a poorly functional contralateral renal unit are generally absolute indications for nephron-sparing surgery (NSS). The latter scenario could result from the concomitant presence of unilateral renal cell carcinoma (RCC) and a contralateral kidney with disease processes (eg, chronic pyelonephritis, renal arterial disease, calculus disease) or the presence of systemic diseases (eg, diabetes). NSS in the solitary kidney is a challenging procedure, but good clinical outcomes can be achieved. In a study from the Mayo Clinic, the 5- and 10-year overall and cancer-specific survival rates were 74.7% and 45.8% and 80.7% and 63.7%, respectively. Interestingly, recurrence-free and metastasis-free survival rates were 89.2% and 80.3% and 69% and 50.4% at 5 and 10 years, respectively. Tumor stage and grade were significant predictors of death of any cause in this group of patients. NSS is also indicated for RCC in patients with a normal contralateral renal unit, especially in younger patients with an incidental, localized, single, small (< 4 cm) RCC. Approximately 10-15% of small (< 3 cm) solid renal tumors are oncocytomas. A study from the Mayo Clinic of 106 renal masses treated with surgical resection revealed that 14% were benign (10% were oncocytomas). When considering tumors smaller than 4 cm, the incidence of benign tumors increased to 22%, 18% of which were oncocytomas. Considering these factors, NSS would prevent unwarranted removal of a kidney for a benign lesion. Recently, the indications for NSS have expanded to include all T1 lesions (1997 TNM staging system, up to 7 cm), even in the setting of a normal contralateral kidney. Patients have to be appropriately selected and counseled, but recent data from UCLA support this approach. When comparing T1 lesions under the previous 1987 staging system, in which T1 tumors were smaller than 4 cm with T1 lesions under the 1997 system, in which T1 tumors include lesions as large as 7 cm, no difference in survival was noted. Other indications for NSS include hereditary papillary RCC and RCC associated with von Hippel-Lindau (VHL) syndrome. These syndromes are associated with multiple, multifocal renal lesions that cover the whole spectrum—from cysts to cystic renal neoplasms to solid renal neoplasms. These tumors are generally detected at an earlier stage than conventional sporadic RCC and are generally treated with NSS. Because of the relatively low metastatic potential of small renal masses, lesions smaller than 3 cm are generally monitored with careful surveillance to delay the onset of dialysis. When the lesion approaches or exceeds 3 cm, NSS is advocated when amenable to delay the onset of end-stage renal disease. In addition to size, the location of the lesion in the kidney is an important criterion when considering NSS. Centrally located tumors near the hilum and adjacent to the collecting system are technically more difficult to remove than exophytic peripheral lesions. A recent study revealed that treatment with NSS or radical nephrectomy is equally effective, regardless of tumor location. No differences in 5-year cancer-specific (100% vs 97%) tumor recurrence rates (5.7% vs 4.5%) or postoperative renal function or complications exist between centrally or peripherally located tumors, respectively. The value of NSS is realized further when one considers the unreliability of current imaging studies in distinguishing between malignant and benign tumors of the kidney. The most clinically relevant scenario is that of a small Bosniak category III lesion that does not meet the criteria of a clearly malignant or benign lesion. Simply stated, the Bosniak classification system divides renal cystic lesions into 4 categories based on CT scan criteria: I, simple cysts; II, mildly complicated but clearly benign cysts; III, more complicated cysts that need histologic confirmation for diagnosis; and IV, cystic neoplasms. Renal exploration and NSS are indicated and are the ideal form of treatment. Radical nephrectomy in this setting is excessive in the modern era. Not all renal lesions are easily classified by the Bosniak system. Category I and IV lesions are relatively easy to designate because the former is a simple cyst and the latter is a cystic renal neoplasm with clearly solid enhancing regions. These lesions are usually diagnosed with a large degree of accuracy and confidence. The main problem is in differentiating some complicated category II lesions from category III lesions. Category II lesions are predominantly cysts with 1 or 2 septae, perhaps with thin, smooth, and small calcifications in the wall or septum. As the number of septae and irregularities in the calcifications increase, the lesion approaches a category III designation. Category III lesions have increased and thick calcifications and septae with enhancing walls or septae. These require exploration because 50% are malignant. Some category II lesions that are clearly cystic and have some worrisome features (but not enough to categorize them as a Bosniak III lesions [eg, 3 or 4 septae with some calcification but no enhancement]) can be designated as Bosniak IIF and monitored with CT scans every 6 months and then every 12 months to establish their behavior. Partial nephrectomy is the treatment of choice for certain benign conditions and localized pathology of the kidney. These include traumatic irreversible injury to a localized portion of the kidney and removal of a benign renal tumor such as an oncocytoma, angiomyolipoma, or multilocular cyst. Other indications include an obstructed atrophied segment of a duplicated kidney, calculous disease of a renal segment with impaired drainage, and, rarely, renovascular hypertension with identifiable noncorrectible branch renal artery disease. The vascular supply of the kidney is an important consideration for partial nephrectomy. The arterial anatomy supplies 4 distinct renal segments, including apical, inferior, posterior, and basilar segments. The number of arterial branches varies, especially the segmental arteries, all of which are end arteries. The renal artery typically divides into 4 or more segmental branches. The first segmental division is the posterior branch, which exits the main renal artery before it enters the renal hilum. The 4 anterior segmental vessels are, from superior to inferior, the apical, upper, middle, and lower anterior segmental arteries. The segmental arteries branch into lobar arteries, which branch again to form the interlobar arteries. The venous anatomy differs on each side and differs from the arterial supply. Venous branches within each segment form a fine anastomosing network that allows for liberal venous ligation within the parenchyma at the time of nephron-sparing surgery (NSS), with little worry about segmental infarction. Small venous branches can be ligated to allow mobilization and retraction of the major renal veins and the segmental veins at the hilum for exposure. The left renal vein is longer. It branches into a lumbar, adrenal, and gonadal vein before entering the renal sinus. The right renal vein has no significant collaterals. The adrenal and gonadal veins that drain straight into the inferior vena cava are an important consideration in renal surgery. At the renal hilum, the renal vein lies most anteriorly, and the artery lies behind it. Both the vein and the artery lie anterior to the renal pelvis. Nephron-sparing surgery (NSS) is generally contraindicated in the presence of obvious nodal metastases. This information is usually obtained based on preoperative cross-sectional imaging. CT scanning can help detect extensive lymphadenopathy that is most likely secondary to tumor metastases. However, CT scanning does not reveal limited lymph node involvement, and a small number of patients are found to have enlarged lymph nodes on CT scans that are not involved with tumor at the time of surgery. Importantly, do not deny these patients the potential for cure and renal preservation based on false-positive findings on CT scans. In addition, the status of equivocal lymph nodes can be assessed by intraoperative frozen sections. The role of positron emission tomography (PET) scanning in this scenario is not well known (see Imaging Studies).Partial nephrectomy is also contraindicated in the presence of inferior vena cava thrombus and a normal contralateral kidney. In the rare clinical scenario of a solitary kidney and an inferior vena cava thrombus, NSS can be considered if the primary lesion is anatomically amenable to resection. Ghavamian R, Cheville JC, Lohse CM, Weaver AL, Zincke H, Blute ML. Renal cell carcinoma in the solitary kidney: an analysis of complications and outcome after nephron sparing surgery. J Urol. 2002 Aug. 168(2):454-9. [Medline]. Belldegrun A, Tsui KH, deKernion JB, Smith RB. Efficacy of nephron-sparing surgery for renal cell carcinoma: analysis based on the new 1997 tumor-node-metastasis staging system. J Clin Oncol. 1999 Sep. 17(9):2868-75. [Medline]. Richstone L, Montag S, Ost MC, et al. Predictors of hemorrhage after laparoscopic partial nephrectomy. Urology. 2011 Jan. 77(1):88-91. [Medline]. Potretzke AM, Knight BA, Zargar H, Kaouk JH, Barod R, Rogers CG, et al. Urinary fistula after robot-assisted partial nephrectomy: a multicentre analysis of 1 791 patients. BJU Int. 2016 Jan. 117 (1):131-7. [Medline]. Huang WC, Levey AS, Serio AM, et al. Chronic kidney disease after nephrectomy in patients with renal cortical tumours: a retrospective cohort study. Lancet Oncol. 2006 Sep. 7(9):735-40. [Medline]. Licht MR, Novick AC, Goormastic M. Nephron sparing surgery in incidental versus suspected renal cell carcinoma. J Urol. 1994 Jul. 152(1):39-42. [Medline]. Kletscher BA, Qian J, Bostwick DG, Andrews PE, Zincke H. Prospective analysis of multifocality in renal cell carcinoma: influence of histological pattern, grade, number, size, volume and deoxyribonucleic acid ploidy. J Urol. 1995 Mar. 153(3 Pt 2):904-6. [Medline]. Van Poppel H, Bamelis B, Oyen R, Baert L. Partial nephrectomy for renal cell carcinoma can achieve long-term tumor control. J Urol. 1998 Sep. 160(3 Pt 1):674-8. [Medline]. Lau WK, Blute ML, Weaver AL, Torres VE, Zincke H. Matched comparison of radical nephrectomy vs nephron-sparing surgery in patients with unilateral renal cell carcinoma and a normal contralateral kidney. Mayo Clin Proc. 2000 Dec. 75(12):1236-42. [Medline]. Dechet CB, Blute ML, Zincke H. Nephron sparing surgery for unilateral renal cell carcinoma: which variables contribute to contralateral recurrence?. J Urol. 1998. 159:169 A.
Krejci KG, Blute ML, Cheville JC, Sebo TJ, Lohse CM, Zincke H. Nephron-sparing surgery for renal cell carcinoma: clinicopathologic features predictive of patient outcome. Urology. 2003 Oct. 62(4):641-6. [Medline]. Gill IS, Matin SF, Desai MM, et al. Comparative analysis of laparoscopic versus open partial nephrectomy for renal tumors in 200 patients. J Urol. 2003 Jul. 170(1):64-8. [Medline]. Rogers CG, Singh A, Blatt AM, Linehan WM, Pinto PA. Robotic partial nephrectomy for complex renal tumors: surgical technique. Eur Urol. 2008 Mar. 53(3):514-23. [Medline]. Ficarra V, Bhayani S, Porter J, et al. Predictors of warm ischemia time and perioperative complications in a multicenter, international series of robot-assisted partial nephrectomy. Eur Urol. 2012 Feb. 61(2):395-402. [Medline]. Mir SA, Cadeddu JA, Sleeper JP, Lotan Y. Cost comparison of robotic, laparoscopic, and open partial nephrectomy. J Endourol. 2011 Mar. 25(3):447-53. [Medline]. Gill IS, Novick AC, Meraney AM, et al. Laparoscopic renal cryoablation in 32 patients. Urology. 2000 Nov 1. 56(5):748-53. [Medline]. Bosniak MA. The use of the Bosniak classification system for renal cysts and cystic tumors. J Urol. 1997 May. 157(5):1852-3. [Medline]. Butler BP, Novick AC, Miller DP, Campbell SA, Licht MR. Management of small unilateral renal cell carcinomas: radical versus nephron-sparing surgery. Urology. 1995 Jan. 45(1):34-40; discussion 40-1. [Medline]. Campbell SC, Novick AC, Streem SB, Klein E, Licht M. Complications of nephron sparing surgery for renal tumors. J Urol. 1994 May. 151(5):1177-80. [Medline]. Duffey BG, Choyke PL, Glenn G, et al. The relationship between renal tumor size and metastases in patients with von Hippel-Lindau disease. J Urol. 2004 Jul. 172(1):63-5. [Medline]. Gill IS, Hsu TH, Fox RL, et al. Laparoscopic and percutaneous radiofrequency ablation of the kidney: acute and chronic porcine study. Urology. 2000 Aug 1. 56(2):197-200. [Medline]. Hafez KS, Novick AC, Butler BP. Management of small solitary unilateral renal cell carcinomas: impact of central versus peripheral tumor location. J Urol. 1998 Apr. 159(4):1156-60. [Medline]. Hoh CK, Seltzer MA, Franklin J, deKernion JB, Phelps ME, Belldegrun A. Positron emission tomography in urological oncology. J Urol. 1998 Feb. 159(2):347-56. [Medline]. Lang EK. Comparison of dynamic and conventional computed tomography, angiography, and ultrasonography in the staging of renal cell carcinoma. Cancer. 1984 Nov 15. 54(10):2205-14. [Medline]. Lerner SE, Hawkins CA, Blute ML, et al. Disease outcome in patients with low stage renal cell carcinoma treated with nephron sparing or radical surgery. J Urol. 1996 Jun. 155(6):1868-73. [Medline]. Morgan WR, Zincke H. Progression and survival after renal-conserving surgery for renal cell carcinoma: experience in 104 patients and extended followup. J Urol. 1990 Oct. 144(4):852-7; discussion 857-8. [Medline]. Ornstein DK, Lubensky IA, Venzon D, Zbar B, Linehan WM, Walther MM. Prevalence of microscopic tumors in normal appearing renal parenchyma of patients with hereditary papillary renal cancer. J Urol. 2000 Feb. 163(2):431-3. [Medline]. Russo P. Open partial nephrectomy: an essential contemporary operation. Nat Clin Pract Urol. 2006 Jan. 3(1):2-3. [Medline]. Steinbach F, Novick AC, Zincke H, et al. Treatment of renal cell carcinoma in von Hippel-Lindau disease: a multicenter study. J Urol. 1995 Jun. 153(6):1812-6. [Medline]. Uzzo RG, Novick AC. Nephron sparing surgery for renal tumors: indications, techniques and outcomes. J Urol. 2001 Jul. 166(1):6-18. [Medline]. Walther MM, Lubensky IA, Venzon D, Zbar B, Linehan WM. Prevalence of microscopic lesions in grossly normal renal parenchyma from patients with von Hippel-Lindau disease, sporadic renal cell carcinoma and no renal disease: clinical implications. J Urol. 1995 Dec. 154(6):2010-4; discussion 2014-5. [Medline]. Zincke H, Ghavamian R. Partial nephrectomy for renal cell cancer is here to stay--more data on this issue. J Urol. 1998 Apr. 159(4):1161-2. [Medline]. Kunath F, Schmidt S, Krabbe LM, Miernik A, Dahm P, Cleves A, et al. Partial nephrectomy versus radical nephrectomy for clinical localised renal masses. Cochrane Database Syst Rev. 2017 May 9. 5:CD012045. [Medline]. Greco F, Autorino R, Altieri V, Campbell S, Ficarra V, Gill I, et al. Ischemia Techniques in Nephron-sparing Surgery: A Systematic Review and Meta-Analysis of Surgical, Oncological, and Functional Outcomes. Eur Urol. 2019 Mar. 75 (3):477-491. [Medline]. Enucleation with a rim of normal parenchyma. Segmental artery can be injected with indigo-carmine to delineate the supply area. Ice slush is applied to the isolated kidney, and the core renal parenchymal temperature is lowered. The renal collecting system, if entered, is closed and the edges of the defect are approximated manually. Renal parenchymal repair using Gore-Tex graft.